Five miles (8km) south of the city centre lie the magnificent Kirstenbosch National Botanical Gardens, covering a huge expanse of the rugged southwestern slopes of the Table Mountain range. 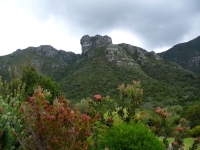 Kirstenbosch was bequeathed to the nation by mining magnate Cecil Rhodes in 1895, and today contains more than 22,000 plants, a research unit, botanical library, and nursery. Numerous paths meander through the gardens, including a Braille route for the blind, which are full of lush shrubs and fynbos, the Cape's indigenous floral heritage. The gardens are a natural wonderland loomed over by the beautiful mountains with endless space for picnics and walks. Several incredible hikes can be started from the gardens, including the formidable Skeleton Gorge, and Nursery Ravine which wind steeply up the mountain and generally take between four and six hours. If these difficult hikes sound a little frightening, there are also much gentler and shorter walking trails winding through the gardens. A tea room, two restaurants, and a coffee bar are on site. In summertime, the delightful setting becomes the venue for Sunday evening open-air concerts, when picnickers relax on the lawns, sipping wine, and enjoying the sunset entertainment. There are also outdoor movie screenings in summer.